We are in the homestretch of Quarter 1 now, in week 8! 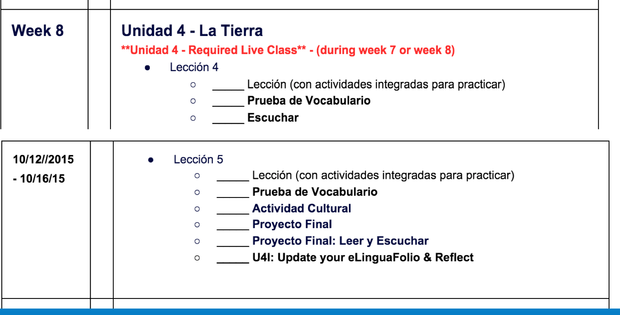 This week we are continuing Unit 4, La Tierra, lessons 4 and 5 which consists of several assignments. Students should have already completed Unit 4, lessons 1, 2 and 3 this past Friday. I spoke with all parents this week, or left a message about your student's progress. In addition, students will be doing a Final project for Unit 3/4 this week where they combine the two units. Please encourage your student to start working on this project and contact me if they have questions or need ideas. NCVPS does not have Fall Break. 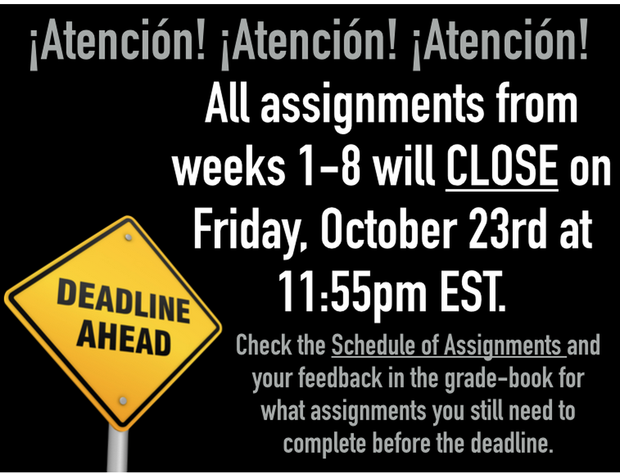 If your student's school has Fall Break, he or she is still expected to login daily and complete the week's assignments for this class. Students are also encouraged to work ahead. Below is a list of what is due by this Friday, October 16. 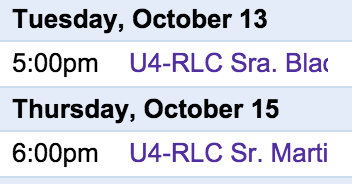 Students have 2 opportunities to attend an RLC for Unit 4 this week. If your student is/was unable to attend an RLC for Unit 4, tell them to contact me for information on making up the RLC. It is critical that students get caught up if they are behind and go back and make sure that ALL assignments have been completed so they do not calculate as 0s. I have asked students to text or email me that they understand that Weeks 1-8, Getting Started Unit and Units 1-4, will close on Friday, October 23 @ 11:55pm. 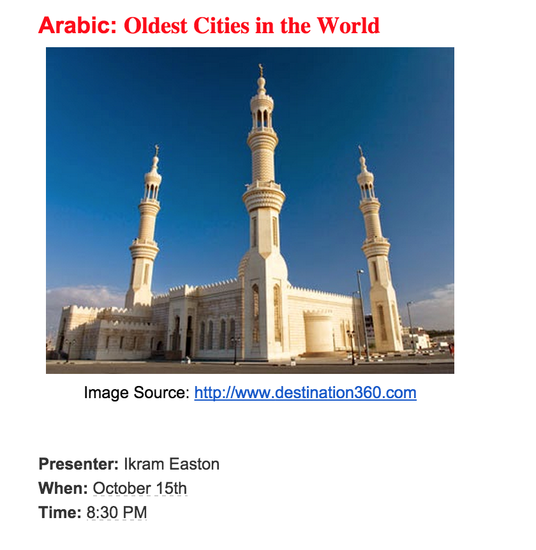 Students have the opportunity to attend sessions in the Culture Cafe for extra credit. 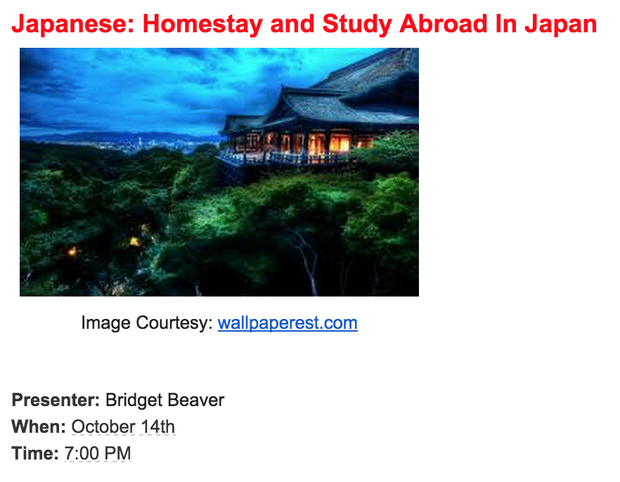 This week students have two Culture Cafe session they can attend. 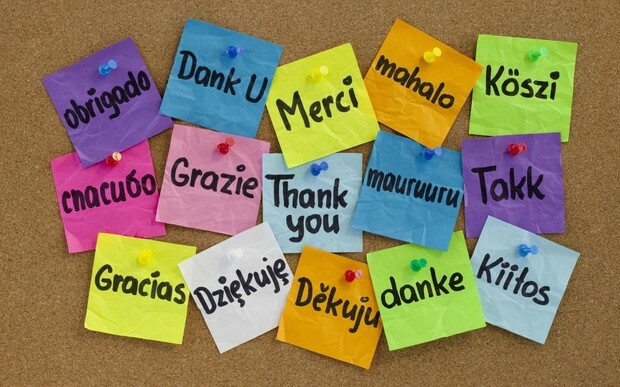 The extra credit for attending a Culture Cafe goes towards the student's participation grade. In addition, students can attend any of the sessions as it does not have to be about Spanish. Below is information about the two sessions this week. Students can click on the Culture Cafe Block/Button on the main Moodle page to enter the session. After attending a Culture Cafe session, students will complete a reflection about the class and submit it for extra credit. 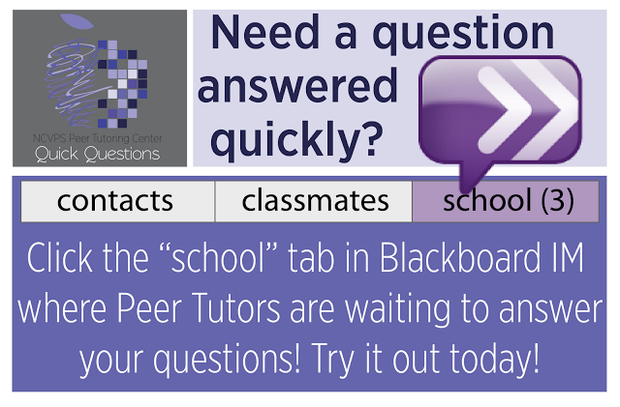 The Peer Tutor Center can help your student! I am here to help your student but another great resource is available at your student's fingertips!